A young, smart dressed man went on a rampage at a Mazda dealership in San Diego, CA, causing around $50,000 in damages. 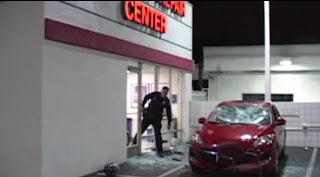 Police weren't sure why the man, named locally as Edward Roth, vandalised a row of new cars and some offices within the showroom. The dealership claim they have never interacted with Roth, making the rampage even more random. In the CCTV footage, Roth is seen talking on the phone before throwing it at a Mazda CX-9, and that's where the trouble begins. He starts kicking the door of the CX-9, before smashing the windscreen's of the Mazda3 and Mazda6 models. Unfortunately, a customer's car was caught up in the crossfire. Police believe Roth may have been drinking before hand at a nearby bar and got a phone call along the way.